I founded the company in 2005 as I saw my clients struggle with implementing multi-million dollar software platforms after months of going through a painstaking selection process. Seeing a divide between expectations and delivery, my vision was to bridge the gap between business and technology by deepening collaboration and building stronger delivery practices that aligned business goals and implementation results. With each clients’ success, a reputation was earned for delivering results. My expertise is in removing obstacles, building motivated collaborative teams, improving delivery practices, and most importantly, aligning stakeholders, project teams and vendors. Specializing in Project Recovery, I manage the toughest situations to resolve serious and costly issues including, stalled contract negotiations, low stakeholder engagement, high defect rates, poor communication, limited user involvement, and out of control scope creep. In each situation, I worked closely with all parties to resolve all open issues and our teams diligently executed to close out each projects to the satisfaction of the stakeholders and executive sponsors. Coaching evokes insight and catalyzes subtle and deeply meaningful changes to people’s core beliefs about themselves and brings essential insight that creates the path to take deliberate action to close the gap between where they are and where they want to be. In the work environment, coaching creates a safe space and brings out the inner leader where each person feels valued for their contribution both individually and as a core team member. Creating a community of leaders creates a culture of engagement and catapults performance. Building stronger teams and relationships are at the core of successful execution. Throughout the company’s history, mentoring and coaching individuals and teams has been directly correlated to every successful project. Coaching is an integral part of the my approach as it aligns with my mission of providing value well beyond the existing engagement by strengthening delivery practices and creating a legacy of leaders. Nina has developed a reputation for consistently delivering results; even in the most challenging of circumstances. Having roots as a serial entrepreneur, strategic enterprise consultant, sales leader, and a practicing leadership, team and life coach, she brings a wealth of successful best practices to her clients. Leveraging more than 20 years of management experience and delivering global programs since 2005 for top financial institutions has resulted in a unique collaborative execution-focused approach that has earned her respect and trust from the teams she has led, the executives that have realized returns, and vendors that achieved success with her partnership approach. Commitment. Respect for the contribution of others, engaging positively and encouraging the best from those we work with produces high quality results every time. Relationships. Collaboration and building consensus amongst stakeholders and IT is vital to fostering trusting relationships and aligning business and IT. Transparency. Openly sharing information between teams is an integral part of navigating complexity and mitigating risk, and serves as the cornerstone of trust. Accountability. Being decisive and accountable are essential characteristics of leadership which elevates team effectiveness and expedites delivery. Integrity. Honesty and objectivity is at the heart of every interaction with our clients and associated third party relationships. Diligence. Planning, frequent checks to stay the course, and determined follow-through are key to reaching the end goal. 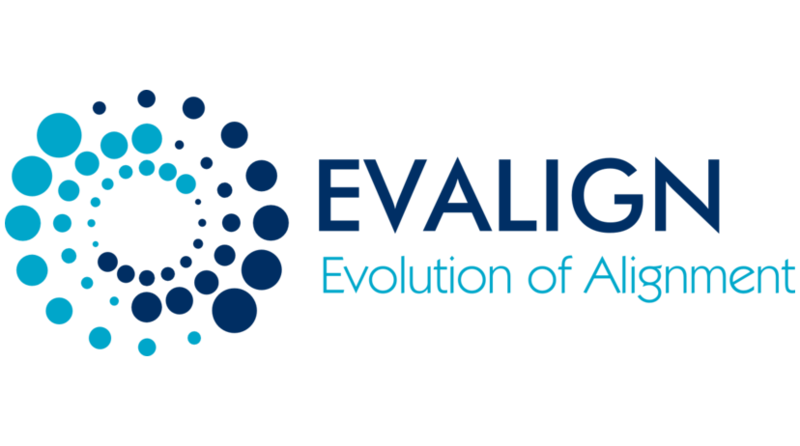 Evalign is a boutique consulting firm that excels at business and technology global project delivery and coaching leaders and teams to strengthen leadership and performance.